alaTest har samlet og analyseret 807 anmeldelser fra magasiner og hjemmesider. Folk kan virkelig godt lide størrelsen. Vi analyserede bruger- og ekspertratings, produktalder og andre faktorer. Sammenlignet med andre Stationære Computere får Apple iMac 27-inch Retina 5K, Late 2014 (MF886, Z0QX) en samlet alaScore™ på 95/100 = Fremragende kvalitet. With a starting price of £2000/$2499 this is not a computer for the masses. But when you consider that the price of a good 27-inch 4K screen is upwards of £1000/$1500, the iMac Retina 5K doesn't seem unreasonable. 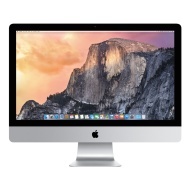 Editors' Note: This version of the Apple iMac With Retina 5K Display has been updated. A full review of the most current Apple iMac With Retina 5K Display can be found here.